I was back in the Buffalo area again last week for my (gasp) 10 year college reunion. I truly still feel like I’m 21 years old so this shocking slap back into reality stung a little bit. Driving back onto the St. Bonaventure campus I felt like I was having some weird out of body experience. I had spent so much time here and yet it felt completely foreign to me. Luckily we ran into some old friends right outside our building and after a few minutes (and a couple of beers) I felt a LOT more at ease. The weekend was divided up with various class events both on and off campus. After the first night’s disgusting food showing at the Old Library (think Munster cheese on top a hard overcooked filet mignon) Mr. T and I decided to do our own food events the rest of the weekend. Our first stop Saturday morning was for a Bonaventure staple- the Burton Burger. They take a nice thick patty, throw it on an indoor grill and top it with a slice of cheddar cheese. The meat is pretty good, slightly overcooked for my taste but juicy enough. What sets this burger apart from others is the salty roll. The top of the bun is literally covered in a thin layer of salt. You can feel the grittiness when you touch the top and each finger licking bite has that salty aftertaste. Obviously this roll isn’t for everyone. Mr. T and I both had enough of it about halfway though but I still enjoyed my burger. The curly fries were forgettable. They lacked that extra crunch and were surprisingly unsalted compared to the burger. Only available between the hours of 12:00-2:00 these burgers were always difficult to get in college (what with class and sleeping all day). Looking back now on the few times I actually was able to enjoy one I don’t really feel like I was missing out on anything now. It’s a decent burger but I enjoyed my mid-day naps a little too much to give up for this back in the day. Later that night we skipped out on another reunion event and instead had dinner at our favorite place in town the Beef & Barrel. This place has been around since 1965 and I’m pretty sure not much has changed in décor or flavor over the years. At various moments over the past ten years Mr. T and I have had serious cravings for their roast beef dinners so that’s exactly what we got. 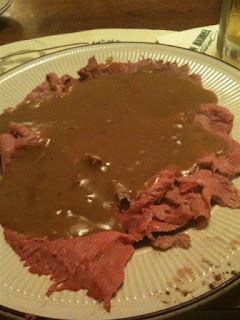 They carve slices of tender roast beef to order and slather it with a thick brown gravy. No it doesn’t always look pretty but damn it’s always tasty. In classic upstate style the portion was huge so we each took a doggie bag home perfect for eating late night after some serious beer drinking. So that was our Bonaventure experience. I did stop at the dining hall on the way out for breakfast and it was just as awful as ever. We also bookended the weekend with two trips to the Bar Bill for the best wings ever. Beef, wings and lots of beer- classic Buffalo trip I’d say.